Sunshine Through the Rain: It's been a while! I have been preoccupied with life, as well as some sewing, recently, and have neglected my little blog. So a quick catch up. A friend (from the US) is getting married on Saturday. She asked me to make a ring pillow for the wedding. I honestly had to google what a ring pillow was, but once I saw a few examples it was all quite straightforward. She had also told us (in her bridal shower invitation - another new experience for me!) what colour linens she wanted for each room in her house. 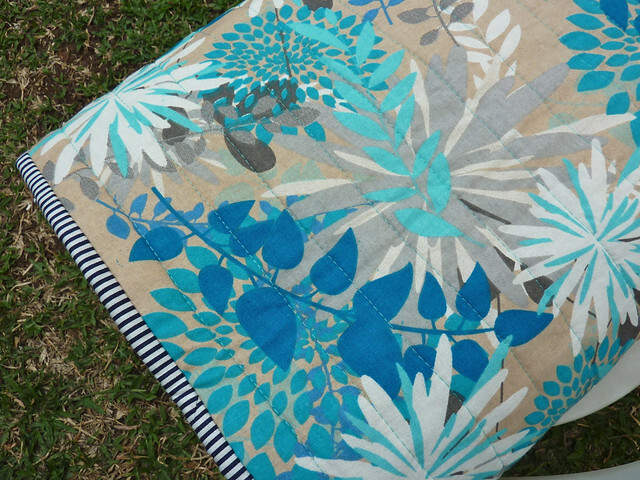 I happened to be in Singapore when I received the invitation and during a quick trip to Spotlight I spotted the most perfect fabric for her living room (she had asked for cobalt blue and brown with an accent colour of turquoise!). So of course I had to buy it and made it into a whole-cloth lap quilt for her. I made a pieced backing from my stash and used a striped binding - my favourite at the moment! In non-wedding news, two of my best Indonesian friends had birthdays recently and I wanted to gift them something handmade. I decided on a second Hello Kitty zippered pouch, and a cushion/pillow made using an April Showers mini-charm pack. 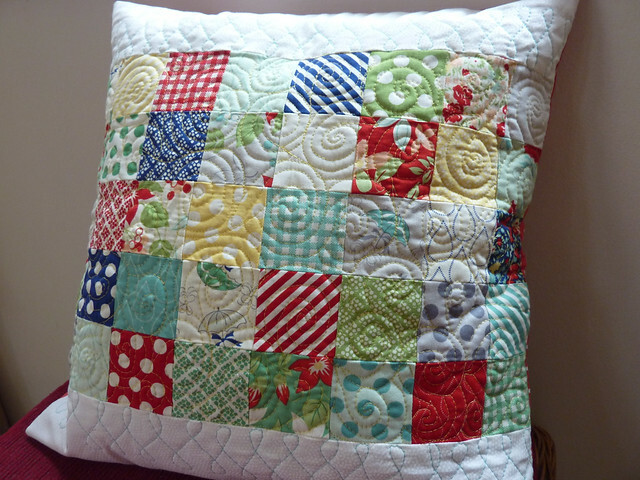 I used the cushion as an excuse to practice my very rusty FMQ using yellow and teal Aurifil threads. This was the first time I have tried FMQ on my Juki and it was so much easier than on my old machine. I think the speed control really really helped! I am really itching to get working on a quilt now, just a few more smaller projects to finish first! Gorgeous makes Deborah, that Spotlight fabric is stunning. Each of these finishes is wonderful, you must have a great sense of satisfaction. Love the whole cloth quilt and the perfect timing of the invitation/colour news, a very happy project! Such a lovely collection - your friends should all be delighted! All such lovely makes Deborah! The teal fabric is a wonderful colour, isn't it? 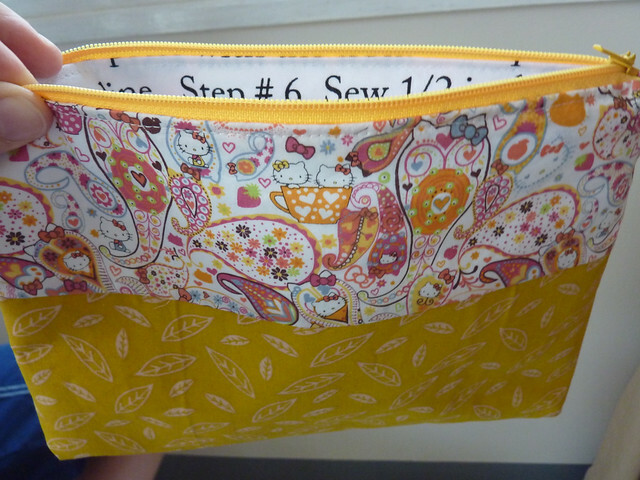 And the sweet fabric in the pouch is perfectly co-ordinated! Glad to hear that you love the Juki too! Turning that lovely fabric into a wholecloth quilt was brilliant. 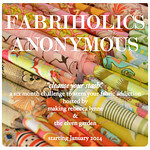 I need to take a move from your playbook and transform some on my especially loved stash into a wholecloth quilt! It does such justice to a large-scale print like that. Youve been busy making wonderful gifts. 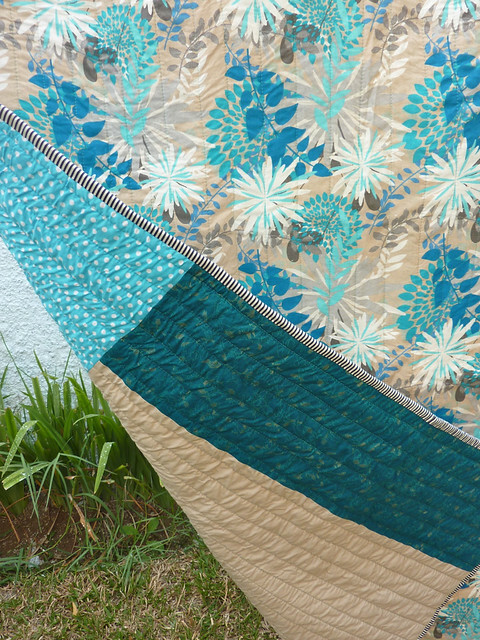 The wholecloth quilt is lovely and the colours sound like the perfect match. Your FMQ looks great! I can never manage spirals like yours. Pretty projects! I like those flowers on the quilt especially! I love the Singapore fabric purchase. Really smart. Love the colours in the lap quilt. 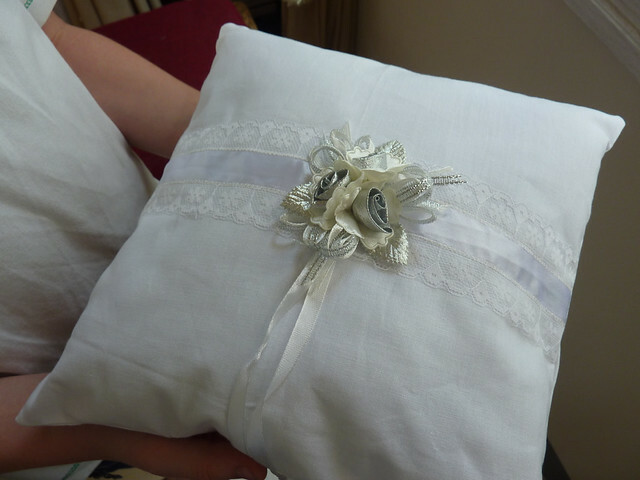 And the ring pillow looks lovely.